A happy marriage of sweet, sour, and salty, this dish is sure to satisfy. 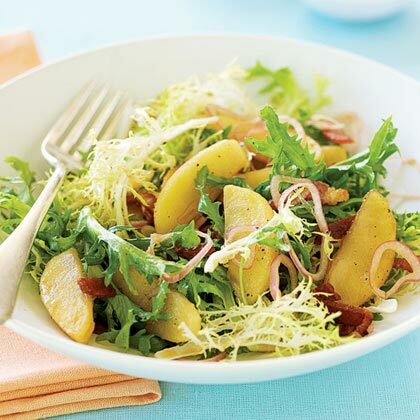 The warm bacon dressing wilts the frisée slightly, so dress the salad immediately before you serve it. Preheat oven to 400º. In a small bowl, combine apples, olive oil, syrup, salt, and pepper. Toss to coat, then transfer apple slices to a nonstick baking sheet and bake for 15 minutes. Stir, then continue to cook until golden brown and tender, 10 to 15 minutes more. Set aside. Meanwhile, in a small bowl, combine shallots and vinegar. Set aside. In a heavy frying pan over medium heat, cook bacon until crisp and brown, about 7 minutes; drain on paper towels. Pour off all but 3 tbsp. of the accumulated bacon fat and return pan to low heat. Remove shallots from vinegar, reserving shallots, and add vinegar to hot bacon fat, whisking until dressing is emulsified. Arrange frisée in a bowl and add apples, bacon pieces, and shallots. Pour warm dressing over greens and toss to coat. Serve immediately.